Ask RP Photonics for any advice in the context of frequency doubling – e.g. concerning the choice of nonlinear crystal, the calculation of possible efficiencies, or the design of resonant doubling cavities. Frequency doubling (second-harmonic generation) in a nonlinear crystal often cannot be made very efficient with a single pass through the nonlinear crystal, if the available pump power is relatively low, or if sufficiently high optical intensities can not be applied due to the low damage threshold of the crystal material. A frequently used technique for boosting the conversion efficiency in such cases is resonant frequency doubling, i.e. the placement of the nonlinear crystal within a resonant enhancement cavity. Singly-resonant frequency doubling is usually based on the resonant enhancement of the pump wave only, whereas the second-harmonic wave is strongly coupled out of the resonator. The resonant pump enhancement increases the conversion efficiency in each pass. Also note that a very high effective conversion efficiency requires a conversion efficiency of only a few percent per pass, because the remaining pump power is recycled in the laser resonator . This also means that the pump intensity can be kept at a lower level than would be required for achieving the same efficiency in single-pass doubling. Alternatively, the cavity may be resonant for the second-harmonic wave only. It may be somewhat surprising that this helps, but looking in detail at the parametric interaction shows that its conversion efficiency depends not only on the pump power but also on the second-harmonic power, which can be boosted with this method. For very low pump powers, the highest conversion efficiencies can be achieved with doubly resonant frequency doubling, where the pump wave and the second-harmonic wave are simultaneously resonant in the cavity . However, it is more delicate to achieve and stabilize this double resonance. Two independent control parameters, such as the crystal temperature and the resonator length, are required. All these techniques were discussed in the seminal paper by Boyd and Kleinman in 1968 . Figure 1: A singly resonant frequency doubler, based on a LiNbO3 crystal with dielectric mirror coatings on the end faces. The coating on the left side has a reflectivity of e.g. 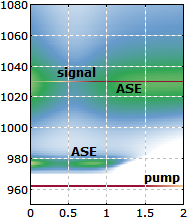 97% for the pump wave and near 100% for the second-harmonic wave, while the coating on the right side is highly reflective for the pump wave and highly transmissive for the second-harmonic wave. See Ref. for details. Resonant doubling is most frequently applied for continuous-wave laser beams from single-frequency lasers. The (normally singly resonant) enhancement cavity can be made either from discrete mirrors or by applying dielectric mirror coatings to the frequency doubler crystal (Figure 1). Such a monolithic resonant doubler is most stable, compact and efficient, but somewhat difficult to characterize, since the different parts (nonlinearity, mirror reflectivities) cannot be tested separately. In any case, the resonance condition has to be stabilized with an automatic feedback system, acting, e.g., on the length of the laser resonator or the doubling cavity. 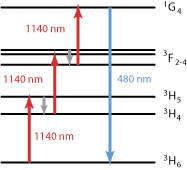 Resonant doubling is also applicable to trains of ultrashort pulses from mode-locked lasers. In that case, the cavity has to be simultaneously resonant for all the lines of the optical spectrum of the pulse train, which is a frequency comb. Normally, the cavity is chosen to have the same optical length as the laser resonator. However, resonant doubling of ultrashort pulses is not very often used, because the intensities achievable are often sufficient for reasonably high conversion efficiencies already in a single pass. In similar forms, resonant nonlinear frequency conversion can be applied to other nonlinear processes such as sum and difference frequency generation. It is in principle also possible to use resonant enhancement of the pump wave of an optical parametric oscillator, but this is rarely used. For efficient frequency conversion with a resonant pump wave, the enhancement cavity has to be designed so that impedance matching is achieved. This means that the transmission coefficient of the input mirror for the pump radiation matches the coefficient quantifying all other losses, including the nonlinear conversion. As the single-pass conversion efficiency depends on the power level, the effective conversion efficiency is maximized for a certain power level and is reduced for further increases in pump power. If impedance matching is achieved and the nonlinear losses for the pump wave dominate over parasitic linear losses, the overall conversion efficiency can be very high – even at moderate optical intensities within the crystal. An interesting alternative to resonant doubling is intracavity frequency doubling. The crucial difference is that intracavity doubling automatically provides a resonant pump wave. Although one usually uses either resonant doubling or intracavity doubling, Ref. demonstrates the combination of both techniques. Here, the frequency-doubling resonator has been placed within the laser resonator of a fiber laser.